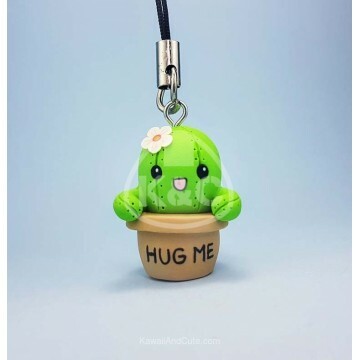 Cute design inspired by an adorable round cactus to use as a keychain or mobile pendant. These pieces are handmade with care and love. All the details in the piece are made with polymer clay, even the smallest details such as eyes, nose, makeup, hair, glitters ... Nothing is painted. It is not made with molds. This makes each piece unique and exclusive; therefore, there may be very small differences with the image provided. We hope you like this creation as much as we enjoy making it.